I want to thank Alexander Garsden and everyone involved in the Inland concert series in Australia. I had a great time, all the other musicians were cooler than me and they showed me you can still have late night fun in Melbourne if not in Sydney. I’ve only just listened to the recordings from both shows now and my sets went about as well as I remembered. Performing live music from a laptop, without using the monitor screen, was a success and the pieces took on a life of their own when played in a way that allowed unexpected aspects of the sound to creep in. 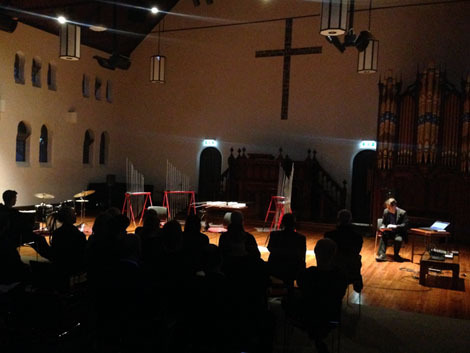 I played three pieces from Chain Of Ponds, adapted for live performance. An album of studio performances is available on Bandcamp, but for these Australian gigs I decided to include new versions of some pieces that haven’t previously gone public. I’ve uploaded a piece from the Melbourne gig – you should be able to stream or download it.